Lovely fully double blooms of lilac mauve. 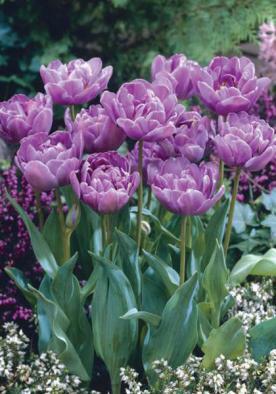 Plant with Tulips of a darker shade for a truly eye-catching combination. 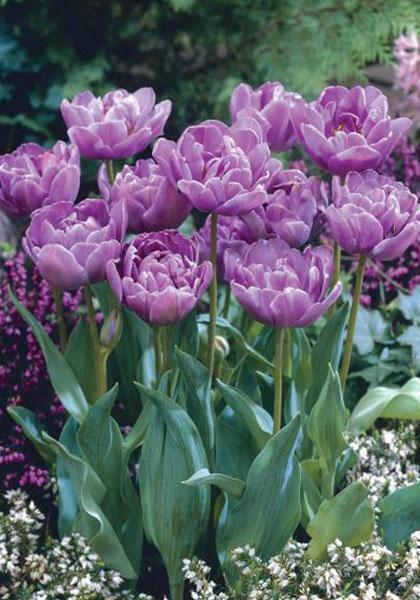 Lilac Perfection is a Paeony Flowered Tulip with large handsome blooms of a deep creamy pink shaded lilac mauve. Slightly later than the similar looking Early Double Tulips the Paeony Flowered come into bloom at the end of April into May. In contrast to the Early Doubles the Paeonies have larger heads and usually have longer stems, around double the height, ranging from 35cm to 70cm, with Lilac Perfection coming in around 45cm. These tulips are robust and are suitable for planting in groups in the border and in pots, however they differ from Early Double Tulips as they are not suitable for indoor culture.